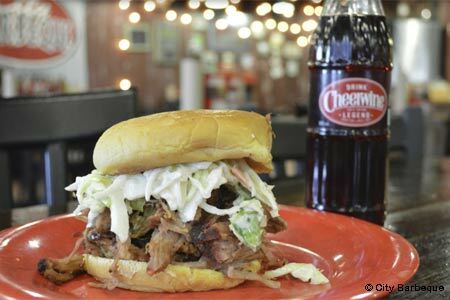 Ohio-founded barbecue chain finds its way into the metro Atlanta area. : Barbecue all around is the name of the game for this Columbus, Ohio-based company. The modern, bright building with lots of glass provides an inviting environment that lacks any aesthetic hint of a 'cue shack. Line up at the register and place your order. Initially very salty, the rub on the brisket has been toned down and now is correctly balanced. But we think the team must remove the fat cap before smoking the meat, because it's dry. Better bets are the pulled pork and the smoked chicken. Sausages are more like hot dogs, but they are tasty, and we're very fond of the vinegar-based slaw that comes with them. Pile it on top. Baked beans are good, and so is the mac 'n' cheese. For a sweet ending, try the banana pudding or the cobbler of the day. Brews focus on local craft quaffs. Attention dog lovers: Fido will find a warm reception on the patio, with water and treats supplied.